While there is still a debate over the effect of the recession we are in, or even if we are in a recession at all, it seems most companies and individuals are preparing for it the best they can. Talks of budget cuts and conserving resources are on everyone’s minds these days. So where does search marketing fit in to all of this? 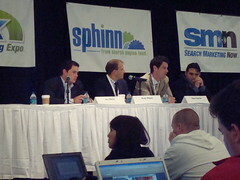 Our expert panel this morning at SMX Advanced – consisting of Jon Miller from Marketo (a TopRank client), Russ Mann of Covario , Dave Davies of Beanstalk Search Engine Positioning and Andrew Beckman of Location3 Media – gave great advice and opinions in how to come out of this recession thriving. Search Marketing and Surviving a Recession consisted of prepared and audience-asked questions to the panel about what we can do as an industry to make it through this economic downturn. An audience poll revealed that many more audience members feel their business will be positively affected by the recession rather than negatively affected. Russ Mann agrees whole-heartedly, saying that the glass is overflowing. He is seeing a major turn from his clients and other large companies spending more money for online marketing and cutting back on their offline marketing. The rest of the panelists follow this same optimistic train of though, though Jon Miller stated that he is being a bit of a realist, and knows that he needs to watch what is happening with his company very closely. Jon started off with saying the biggest concern is that advertising and marketing dollars get cut during a recession. While this worries him, he says to make sure that any marketing efforts completed are measurable and that the marketer can prove the results or their activity. As long as every dollar is accounted for and ROI is proven, marketing should fare pretty well. Russ agrees, saying that since the CEOs and CFOs are tightening the purse strings, it is important to show results and prove the value of the marketing dollars being spent. Dave builds off of this, stating that search marketing is one of the most provable forms of marketing. All we have to do is look at analytics, rankings, clicks, leads and conversions and we know exactly which campaign drove those results. How Should the First Marketing Dollar be Spent? The panel was across the board on this question. Andrew Beckman began by stating that the first marketing dollar needs to be spent on getting back to basics. There are many companies, he says, who are so excited to get to the online promotions aspects that they forget the foundation of SEO is choosing the correct keyword phrases and optimizing title tags and meta descriptions. Dave said to use that first dollar and take a good long look at your website and find out how to make it work for the company’s target customers. Users are getting more internet savvy and they know a bad website when they see one. Keeping your website above the competition can definitely benefit your company. Russ Mann went along with this idea saying that the first dollar should be spent on customer research. It is possible that search is not the best marketing channel for certain companies, but in order to make that decision, you need to do a lot of research first. Rounding up this question, Jon stated that with budgets getting tight, it is important to get the most out of those clicks you are acquiring from your paid campaigns. Test and retest to find what works and make sure you are best spending that first dollar. Tips for Convincing Clients to Keep Dollars in Search? Andrew opened this question up by saying that while it takes time to get a search program up and running smoothly, the longer it takes the company to get in the game, the longer it will take for them to see the return on their search marketing investment. Search marketing has the opportunity to be both a direct marketing and a brand vehicle at the same time, so show the client the results you are giving them and how people are finding their products and services. This identifies benefits to the client from your consultation and helps the client focus on how to get the best results. Where are Businesses Wasting Their Money? While we all waste our money in many different ways, from getting Caribou every morning on the way to work to washing our cars every other day, this question pertains specifically to marketers. Russ jumped in right away and said that he sees the biggest waste of money happening when the bigwigs in the business aren’t on the same page. CFOs may want to increase revenue while CEOs may want to increase brand awareness. By understanding the desires of the company rather than wasting time and money trying to come to one decision, the marketer can begin showing results faster. Jon says there is a lot of money being wasted by marketers shouting to everyone around them rather than focusing on the pull-marketing of search. Take the time to find and pull in the searchers at the end of their buying cycle rather than trying to push your message on most people who aren’t interested. The overall theme here was the idea that we need to be held accountable for all of our activities. In the past, SEOs were more laid back when it came to reporting results. Now we need to make sure all clients’ marketing dollars are going toward the best results, which in turn makes us better as well. By following the tips offered by the panel and managing finances a little more closely than usual, we SEOs will escape on the other end of this recession stronger, with a better skill set, and ready to attack the world again. Just to chime in from the “Conversion Optimization” session from the previous day of the show, if you’re spending money on paid search marketing and you’re not actively managing/optimizing your landing pages, you’re leaving money on the table. We’re in a very “click centric” industry — pay-per-click, cost-per-click, etc. — but it helps to remember that the click is a transitory action. It doesn’t really exist as a physical thing. What DOES exist is the landing experience that someone arrives at when they make that click. So all that money being spent on paid clicks — $20 billion? $30 billion? — is actually billions of dollars being spent on landing experiences. The question is: are yours optimized or neglected? Search marketing will survive, without a doubt, but in a much different form. People are not only searching on Goolge and Yahoo. Proper Social Media Optimization yields fabulous results every time, and drives pages to the top of Google and others much faster than general SEM. Nothing will replace optimization for search engines, that is true, but as the internet changes, they will change, the people and the engines, and Social Media is the first step to a truly connected audience who chooses to see you on their terms. You need to be there, with a suit and a smile. The push Vs pull marketing intrigues me. I absolutely agree that if one wants to sell, its more effective to get to the buyer at the end of the buying cycle (the pull approach). But how do you get the buyer at the end of buying cycle ? Its the Push marketing which gets them there. Its a tradeoff i guess,if you are new and building a brand then you should devote more efforts on the push part. On the other hand if you are comparitively a known name and are more interested in increased sales and numbers then pull them hard!